Last year I introduced a multimedia insects encyclopedia: Meet the Insects – Forest Edition. I was very impressed by the app. I am glad to find out the same developer NCSOFT now has another insects app out: Meet the Insects – Water and Grass Edition. This one focuses on insects living near water and in grassland. Not surprisingly, this one is just as wonderful as the Forest Edition, with beautiful photograph and art works, high quality videos, smooth transitions between sections. It is a great tool for kids to learn about insects. 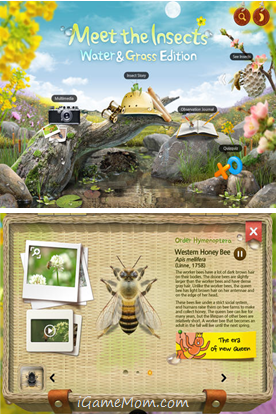 When kids start the app, they will see 5 options on the open screen: Insect Story, Multimedia, See Insects, Observation Journal, and Quiz. A good place to start is Insect Story. Kids will watch 6 short introductory videos about insects, topics include What are Insects, Life Cycles of Insect, They Live in Water and Grass, How Do They Breathe? Each video is about 2 minutes long. Kids can watch them continuously from the first to the last, or just pick the one they are interested in. Once kids are done with all the videos, they will be led to See Insects. Here they can learn about each individual insect – facts, videos and photos. Make sure tap the yellow sticker for fun facts of each insect. There is also a Multimedia section, where you can find all the videos and pictures included in the app. The Observation Journal is where kids can keep record of all the insects they find. They can take photos of the insects, record the location where they find the insect, the weather condition when they find it, and add more notes if they want to. If you want to see how much the kids know about insects, you can ask them to take a Quiz. It actually is quite fun. Meet the insects is a phenomenal app series teaching kids about insects. The pictures and videos are realistic yet beautiful, the language is kids friendly yet scientific, the content is short in each unit yet comprehensive overall. Even if you don’t like insects, it is worth taking a look. Meet the insects series currently has 3 apps: Forest Edition, Village Edition, and Water and Grass Edition. All are available on iPAD. Each is $6.99 on App Store.